Elongation - Silk fibre has an elongation at break of 20-25% under normal condition. At 100% R.H. the extension at break is 33%. Hygroscopic nature - Because silk has a very crystalline polymer system, it is less absorbent than wool but it is more absorbent than cotton. 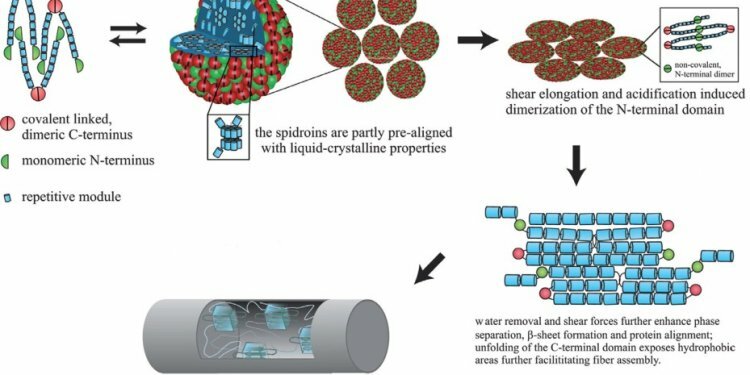 The greater crystallinity of silk's polymer system allows fewer water molecules to enter than do the amorphous polymer system of wool. It absorbs water well (M.R.11%), but it dries fairly quickly. Thermal properties - Silk is more sensitive to heat than wool. This is considered to be partly due to the lack of any covalent cross links in the polymer system of silk, compared with the disulphide bonds which occur in the polymer system of wool. The existing peptide bonds, salt linkages and hydrogen bonds of the silk polymer system tend to break down once the temperature exceeds 1000C. Electrical properties - Silk is a poor conductor of electricity and tends to form static charge when it is handled. This causes difficulties during processing, particularly in dry atmosphere. and regular surface of silk filaments. Drapes Property - Silk fibre is flexible enough and if silk fibre is used to make garments, then the fabric drapes well and this is why it can be tailored well too. Abrasion resistance - Silk fabric possess good abrasion resistance as well as resistance to pilling. Effect of sunlight - Silk is more sensitive light than any other natural fibre. Prolonged exposure to sunlight can cause partially spotted color change. Yellowing of silk fibre is generally occurred due to photo degradation by the action of UV radiation of sunlight. The mechanism of degradation is due to the breaking of hydrogen bonds followed by the oxidation and the eventual hydrolytic fission of the polypeptide chains. Action of water - The absorption of water molecules takes place in the amorphous regions of the fibre, where the water molecules compete with the free active side groups in the polymer system to form cross links with the fibroin chains. As a result, loosening of the total infrastructure takes place accompanied by a decrease in the force required to rupture the fibre and increase extensibility. Treatment of silk in boiling water for a short period of time does not cause any detrimental effect on the properties of silk fibre. But on prolonged boiling, silk fibre tends to loss its strength to some degree, which thought to occur because of hydrolysis action of water. Silk fibre withstands, however, the effect of boiling better than wool. Effect of acids - Silk is degraded more readily by acids than wool. Concentrated sulfuric and hydrochloric acids, especially when hot, cause hydrolysis of peptide linkages and readily dissolve silk. Nitric acid turns the color of silk into yellow. Dilute organic acids show little effect on silk fibre at room temperature, but when concentrated, the dissolution of fibroin may take place. On treating of silk with formic acid of concentrated about 90% for a few minutes, a swelling and contraction of silk fibre occur. Like wool, silk is also amphoteric substance, which possesses the ability to appear as a function of the pH value either as an acid or as a base.